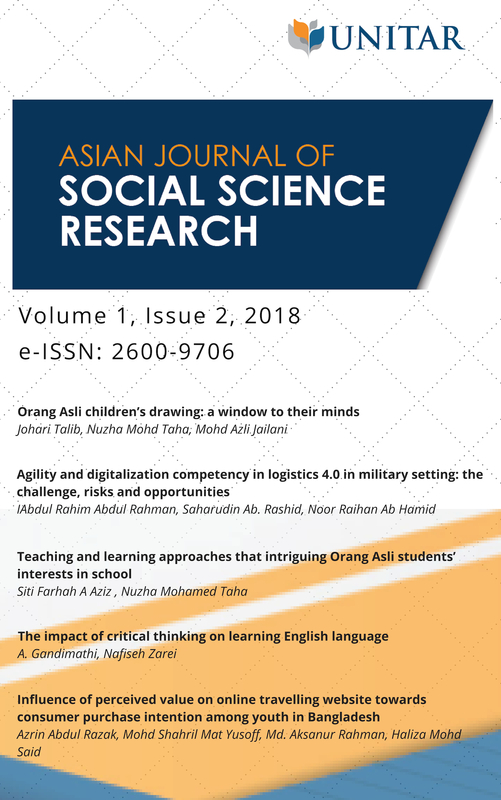 The Asian Journal of Social Science Research is published twice a year by Centre of Experiential Learning and Research Excellence (CELEx) of UNITAR International University. The journal aims at providing a forum for academicians to publish their research output and to promote interdisciplinary studies in social science. The journal welcomes original research articles, review papers, conceptual framework, empirical research and new theories in the fields of education, early childhood studies, business, communications, finance, management, accounting, sociology, hospitality, tourism, human resources, psychology and information technology. AJSSR and its board of editors assume no responsibility for statements and opinions advanced by the authors of its articles. The importance of listening to children’s perception has been emphasized in a wide range of recent research using variety of strategies, including drawing. This paper explores the use of drawing as a strategy to engage with young children around the topic of their life in the forest. Originally there were 40 children taking part in the research, later only ten of them aged 9 to 12 were chosen as final participants. Children were asked to draw anything cross to their mind without restriction to any specific theme. Results of the study depicts for boys, their theme were concentrated on environment, deep forest, and house, fruit orchard in the forest, swimming in the river and hunting activities. Few boys attempted to draw other themes such as football match, car, and invasion of tractor into their village. The themes depicted by children were not much related to the themes present in any of the text books they use in the learning process. Children world views or prior knowledge therefore failed to support the learning process in the classroom suggesting that they may need more exposure to the outside world or they may need a special school curriculum. This paper attempt to integrate Resource Based View (RBV) and Social Exchange Theory (SET) in identifying and analysed the importance of logistics 4.0 through links between logistics 4.0 competency, logistics responsiveness (agility, positioning, distribution support, and service recovery), digital competency and knowledge management practice in the era of Industry 4.0. Sample of 117 military respondents from the Malaysian Armed Forces throughout Malaysia are studied. This study used path analysis with maximum likelihood estimation that estimates the relationship in a structural equation system using AMOS 22. Path analysis results show that the estimated regression weights are significant based on p-value (p-value < 0.05), that is the relationship among the criteria are statistically significant except for the relationship of KMP. In brief, the path analysis model is statistically valid and achieved model fit with Chi square test (z2 (df = 3) = 1.773, p-value = 0.000), CFI = 0.821, TLI = 0.809, IFI = 0.824 and RMSEA = 0.082. Three of four of the hypothesis are supported while KMP was not found to partially mediate the relationship between logistics responsiveness and logistic competency 4.0. This study substantially explains theoretically the available resources that can be exploited to achieve higher standards in employing logistics 4.0 thus contribute to extend logistics 4.0 developments in military setting. From a practical perspective, the findings of this study are expected to facilitate the Malaysian Armed Forces in formulating strategies and capitalizing on the internal capabilities which may provide platforms and opportunities for more effective logistics management. The aim of conducting this research is to identify the teaching and learning approaches that could be appealing to the Orang Asli students in school. This research is a qualitative research that showcases the elements in the approaches of both teaching and learning that could give positive impacts towards the passions and/or interests of the students, especially from the motivation aspects, of how they give high participation of learning in class. This research was focusing among the majority of Semai’s Orang Asli elementary school children. It involved 2 layers with 12 interviews among the experienced teachers who had previously dealt with other Orang Asli people around Tapah, Perak and Cameron Highland, Pahang. The research participants were chosen based on their experiences in teaching the Orang Asli students for more than 3 years. Both schools are elementary schools that have the most Semai’s Orang Asli children as students. The findings of this research have shown that the main element that needed to be focus in order to attract the Orang Asli students’ interests in school are based on the hands-on learning, outdoor learning activities as well as the learning which involves edutainment. The findings of this research too have given impact on the development of educational curriculum by strategizing more effective approaches in understanding the teaching and learning approach among the students of Orang Asli people. Critical thinking has been encouraged largely in Malaysia to create awareness to the public. This is due to the fact that students are not able to use their critical thinking skills in classroom activities. Nowadays, some teachers use the traditional method of teaching whereby the students may not be given the opportunity to think critically. As such, if critical thinking is initiated in schools, it would mould citizens who are more creative and able to use their skills effectively later. This study investigates the use of critical thinking in language learning and how it enhances English language among ESL learners. A qualitative method was used and data were collected using semi-structured interview. The sample involved 30 post graduate students in Selangor in order to gain a deep insight of students’ critical thinking enhancement in English language learning. The data were analysed qualitatively using content analysis. The findings of the study revealed that students were able to learn better using critical thinking which enhanced their English language skills. In conclusion, the results indicated that the students were able to engage in reflective and independent thinking to solve problems in learning by using critical thinking. The purpose of this paper is to examine the influence of perceived value on online traveling websites towards consumer purchase intention among youth in Bangladesh. This research aims to identify the relationship between perceived value factors such as perceived usefulness, perceived ease of use, perceived trust, perceived enjoyment towards consumer purchase intention among youth travelers in Bangladesh. The study was conducted in Dhaka, the capital of Bangladesh. Using survey questionnaire method, the data were collected from two hundred youth respondents comprising of university students. The sample of the study was selected through non-probability convenient sampling at Dhaka University, Bangladesh. The collected data were analyzed using Statistical Package for the Social Science SPSS software. The findings show that all the selected four-factors of online traveling websites have significant influence on the purchase intention among youth travelers in Bangladesh.